When the Sun relents on an ancient river on a hot summer day in Panchavati, the devout make way for evening strollers meandering by the Ram Kund where in the waters of the Godavari Ram once bathed during his exile from Ayodhya. Shepherded downstream through a cemented channel and spanned by walking paths the Godavari trickles gently as it negotiates the Lakshman Kund before flowing through Ram Kund, and over the stepped falls to Dhobi Ghat where women bear their laundry down the steps to the ghat for a quick scrub in the backdrop of a vegetable market operating from under makeshift awnings, corners flapping in the moody breeze. Someone yells at the top of his voice, offering two kilos of onions for ten rupees and no sooner his voice falls and another rises from the other end of the narrow span, offering for two rupees a bunch of coriander leaves that might fetch five times as much in Bombay, 180+ kms. away. Divinity and discounts go hand in hand in Panchavati. While vegetable vendors call out to be heard above their competition, Chivda sellers have to do no such thing. Meanderers, young and old alike, ushered in by the weakening noon combine a quick prayer at the many temples in Panchavati with an evening out by the river and need little encouragement to snack on Chivda sold from the several vending carts in the vicinity, prominently announcing their wares on colourful hand-painted boards. If you’ve lived in Karnataka, Maharashtra, or Gujarat or have had the occasion to travel with Kannadigas, Marathi Manoos or Gujjus then chances are you’ll have heard of Chivda, and likely relished it on long journeys or at their homes. Chivda is light, crunchy, and easy on the senses unless graced with a pinch of chilli too many. Caught up in conversations the heap reduces in a jiffy and before long the lingering taste of a jeera (cumin) seed caught in the teeth quickly flavours the memory of the last mouthful. Those who love Chivda will tell you that any occasion is good enough for a plate. I agree. The flattened rice (also known as Avalakki in Kannada, or Poha in Marathi) is central to the Chivda mixture with other ingredients like roasted gram, dried coconut, fried curry leaves, mustard and cumin seeds, turmeric and chilli powder, Asafetida, and peanuts among others playing around it like in a fusion ensemble, and you can always explain away a jarring note to the exuberance of an instrument stepping out of line out of curiosity. 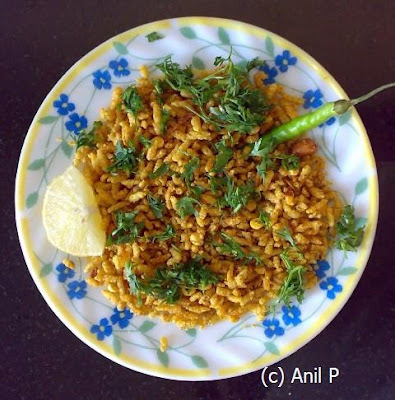 The use of Churmuri (puffed rice) instead of Poha (flattened rice) is not unknown in Chivda mixtures, and likely favoured when short of time in preparing the mixture. The landscape outside the window turns a shade delectable with a dash of lemon and chopped coriander leaves passed along the compartment amid happy banter of travelers. Passed along from plate to plate and squeezed within an inch of its juicy life the lemon will yet yield that final gasp to the spicy mix in keeping with the spirit of things. It is the act of squeezing lemon into Chivda heaped in paper plates or paper cones fashioned from a newspaper picked up from a stall at the railway station that is central to adding the tangy to the traveling experience, and not necessarily the juice though it’ll help the Chivda mixture to be flavoured lemon and garnished with coriander leaves. When traveling in a group, sharing the Chivda counts for more than the small matter of taste, the lack of lemon notwithstanding. Still, Chivda rarely fails to impress. There’re just too many variations on offer for any of them to count as better than the next preparation. It’s a matter of choice as much as it is a matter of acquired taste for, before Chivda came to be available in air tight packing, mums and aunts would spend many a late evening making Chivda to last the week before it was time to make it again. I’m more likely to find Kannadigas from Karnataka favouring Poha (flattened rice) while the Marathi Manoos will likely use Churmuri (puffed rice) as the base ingredient though roasted Poha is also favoured among the community as with the former. The Brahmins however are unlikely to add a touch of garlic to the mixture though exceptions are not unknown. Street-side vendors however are likely to favour Churmuri in preparing Chivda like the Chivdawallah manning Mohan Chivda opposite Gandhi Talaav in Panchavati did. I wonder if it is due to the fact that he also offers Bhel as an option. Personally I prefer fried Poha as base for Chivda. 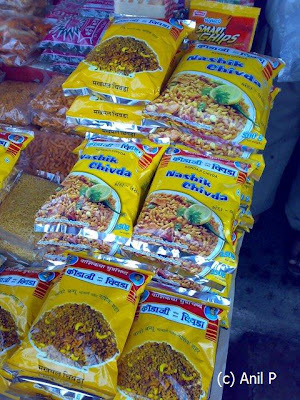 Advertised as tasty and claiming to be Nashik’s famous brand, Mohan Chivda stall offered Bhel, Bhatha, Chivda, and Farsan. Beyond a point it’s left to the vendor’s discretion to determine the difference between Bhel and Chivda, though one would expect Bhel to be based primarily off Churmuri and not Poha as the main base ingredient while with Chivda one might expect more of fried ingredients mixed with roasted Poha or plain Churmuri, more likely the former for, the use of Churmuri in preparing Chivda is not considered the traditional way. Farsan would likely see a preference for Besan (gram pea flour) preparation driving it. However out on the street lines can blur between the preparation of Bhel, Chivda, and Farsan recipes, at most the proportion of ingredients mixed will vary. The elderly vendor manning the Mohan Chivda cart sat surrounded by plastic bags holding close to 10 preparations ready for mixing with Churmuri – Sev, Boondi, roasted Green Peas, roasted Putana, roasted Moong Dal (split and whole), dry Poha seasoned with oil, fried Poha mixed with Putana and roasted peanuts, deep fried Cornflakes, and garnishings – Coriander leaves, chopped onions, and a dash of lemon. The roasting differs from preparation to preparation and is done in varying portions of oil and seasoned with spices like red pepper, coriander powder and salt to taste. And depending upon the option the customers chose from the four available to them - Bhel, Bhatha, Chivda, and Farsan, the Chivda vendor would move quickly, his hands moving swiftly along the arc of plastic bags, picking appropriately from the preparations arrayed around him before sprinkling chopped onion and coriander leaves and topped by a dash of lemon. I asked him for Chivda, priced at rupees Six, filming him as he took a little over a minute before packing it for me. Though the mixture he whipped up resembled Sukha Bhel I was still prepared to eat it as Chivda. As the light fell the steps along the embankment came alive with families and friends out for an evening stroll, and plates of Bhel and Chivda soon appeared in their hands. A Granny with her grand-kid made herself comfortable on the upper step. Elderly Maharashtrian Brahmin faces are a picture of gentle elegance, and sometimes of erudition but rarely without a twinkle in their eyes. A group of three girls to my right were soon dipping into plates of Masala Dosa, oblivious of all else. I unwrapped my Chivda mixture to the tempting fragrance of Masala Dosa wafting my way. Behind me a camel awaited joy riders. Before returning to Bombay the next day we went looking for shops stocking the iconic Kondaji Chivda. Among street-side vendors hawking grapes from cane baskets off Nashik Road railway station, selling the two varieties on display for Rs. 40/- and Rs. 30/- a kilo respectively, we spotted a shop stocking Kondaji Chivda. I turned the pack over to scan its ingredients – Roasted Poha, Refined edible vegetable oil, Groundnuts, Roasted Gram, Sugar, Spices, Coconut, Cocum, Fried Onion, Garlic, and Salt. The spices would hold the key. 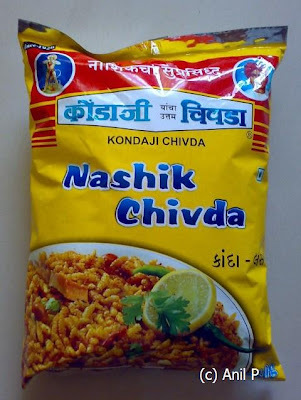 Kondaji Chivda was set up in Nashik by Kondaji Gunaji Wavare and have their branches spread across the city, namely Bhadrakali Market, Malviya Chowk, Panchavati, Mukti Dham, Ganga Ghat and Nashik-Road Bus Stop, an indication of the demand for its Chivda products. The pioneering Kondaji Gunaji Wavare belonged to a Maratha family from Nashik. The Marathas are a grouping of 96 clans and are a politically powerful community in Maharashtra and dominate the politics of the state through numbers and muscle. The legendary warrior king Shivaji was a Maratha. When Kondaji Gunaji Wavare started Kondaji Chivda in 1920 after quitting from his service in the British Government of the time to start off on his own he might not have foreseen that ninety years later the brand would become synonymous with Nashik as Nashik Chivda. When I spoke with his grandson, Surendra Wavare, he recollected an incident Pu La Deshpande, the legendary Marathi Litterateur, apparently narrated in one of his books. Then he told me of how his Ajoba as he referred to his grandfather, Kondaji Gunaji Wavare, went door to door carrying his Chivda preparation in a cane basket, asking skeptical customers to first taste it before deciding on buying it, a strategy that helped convince buyers of its quality. Standing in the shop and looking over sleek packets of Kondaji Chivda I could not help but reflect on the courage and conviction the enterprise will have demanded of Kondaji Gunaji Wavare as he went about introducing it into the market, effectively creating a market where none might’ve existed before. In picking up the shiny packet I connected with a legacy, bridging time and leaping with the faith of an enterprising entrepreneur way back in 1920. While I was also tempted to pick up their other offering, Makhmal Chiwda, displayed alongside, I resisted the urge. Kondaji Chivda’s range of products also include the Poha Chivda and Corn Chivda among others. I paid the shopkeeper Rs. 38/- for the 250 gm. pack and slipped it into my carry bag. Touted as “The Original flavour by: Wavre Bandhu, Nashik” it would’ve been a shame to return from Nashik without bearing a pack of Kondaji Chivda along. Back home I wasted no time in opening the Kondaji Chivda pack before reaching for the crisp Chivda inside but not before garnishing the plate with chopped coriander leaves and a dash of lemon. The green chilli is just for show. I wouldn't dare eat it raw. Glossary: Boondi (deep fried tiny gram flour balls), Putana (split gram), Moong Dal (green coloured lentil), Poha (beaten or flattened rice), Churmuri (puffed rice), and Sev (deep fried gram preparation in the shape of vermicelli). I must delurk and say that I love your photo essays.. Many times I don't even read the accompanying text and the pictures still tell a beautiful story. p.s. : Loved the one on the mysterious lady statue next to the well. Your words and photographs bring everything to life - I can hear the sounds and smell the scents and practically taste it all! The color and life you capture is amazing. Getting my dose from Lalbag's Chivda Galli ASAP! Empowerment Engineer: Thank you. Indian landscapes can differ so much that pictures will invariably convey uniqueness. The lady by the well overlooking the road was a colourful sight. Am glad you delurked. It's always encouraging to receive feedback. Wished more did. Riot Kitty: Am sure you would be. Chivda can be a good appetiser too. With Mangoes making an appearance Kairi would be good choice indeed. What was Chivda preparation like at your home? Sitting at Vithal Kamat's in Nashik, a mango tree in the adjoining compound overflowed with raw mangoes. The stately house was boarded up. Back in Goa this would be about the time we would go raiding mango trees after school hours. Aha, the times we spent ostensibly studying in the shade of mango trees weighed down with mangoes. Talon: Thank you. It's a pleasure to know the post communicates all these feelings. Since there's much that is conducted out on the open street in India, a bit of patience and courage to bear the Sun can result in evocative pictures. India is a sensory place. Not everyone likes the strong smells, but once you negotiate it as an experience it turns into a lifelong love affair. Mumbai Paused: Time to run. Anil P We make our chivda from Churmure and sometimes Bhajke Pohe. Poha chivda is generally Divli fare. In our house , it was all about dry roasting and oil was used quite minimally. Groundnuts and roasted chana was of course there with lots of kadhipatta and chopped mirchi. But the less oil meant you could eat freely without feeling bad. A very nice account ( as always). 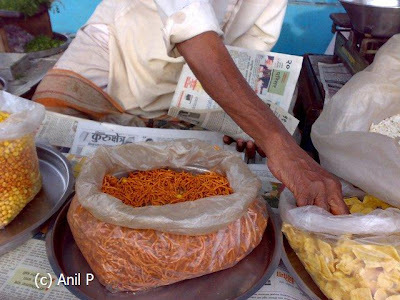 It is amazing how this roadside snack is now a properly packaged and exported food item! There are also some vendors who add some sprouts for the health conscious. Ugich Konitari: Less oil the better, else eating it from newspapers or steel plates stained with oil is not appetising. I do not see many mango trees around in Bombay, unless some housing societies are graced with a tree or two, they might well be. Not having experienced raiding mango trees, most kids out here wouldn't know what they're missing out on in the first place. Where Churmure was used in Chivda, I've usually seen mixed throroughly in a bit of chilli powder and oil (without tadka), then adding peanuts roasted / fried in tadka with Putana and a liberal dose of fried curry leaves until they're crunchy. The other variation with Churmure was mixing it in tadka, all else remaining the same. I prefer Chivda made from fried Poha, minimal oil that is. Kairis sliced and peppered with chilli powder and salt has to be a given in this season. Radha: Thank you. The marketing started long ago, only the packaging got spiffier now. Yes, they do add sprouts sprinkled with lemon to the mixture. Another enlightening and 'masaledar' piece on India. Relished it...I’m your Oliver Twist. What a yum story! I actually have poha in the pantry, so I guess today evening's snack is determined! Love your writing style and will definitely add you on to my blogroll! Roshni Mitra Chintalapati: Thank you. A big tin of Poha Chivda to last a few days will be apt preparation. A lovely read. I always feel as if I have been on a little journey with you and can almost smell and taste the food. and in food! Lovely post. You are such an inspiration and a true blue journalist at heart. I love the way you write and the way you spin a story. Brilliant. Lynn:Thank you. It's a pleasure to know it. Marja-leena: Thank you. As one moves away from large cities in India, colours come into play. Vineeta: Thank you. It's always a pleasure to hear it. There're so many stories around India that it would be difficult to miss out on them. Blogtrotter 2 is waiting your comments at the Cayman Islands. Enjoy and have a great weekend!! I love your photos. It's like a trip to India and I enjoy the tour. Of course, I have never heard of Chivda. It looks like a nice indulgence for a hot day. Loved ur blog....Glad you bumped into mine!....added to my blogroll..dont want to miss any of ur posts! Darlene: Thank you. I'm glad you enjoyed being on the tour. Chiwda garnished with grated coconut, and or coriander leaves, and chopped onion makes from a delectable snack. Hello Anil, thank you for stopping by with your comment. Personally, I liked the book better than the film. But that is usually the case with me. Your writing about your travels is delightful and gives me a glimpse of a life and culture so very different than my own. That is good for a person, not to mention fascinating reading. I love all the color there...and really, I think I would love to wear a sari. Such beautiful fabrics and colors! Your description of the overall experience, magnificent! The added bonus of the sights and sounds of your meandering helps bring the experience even closer. Nicely done, Thanks and Cheers! Dipti: Glad to know you enjoyed the post. There's quite a bit of variety available in terms of Chivda in Nashik, so am sure you'd relish it - the next time you're in Mumbai, hopefully. Sara: I'd imagine the book would score over the movie anyday. That is usually the case. Thank you for your comments about the posts here. I'm glad you're enjoying reading them. Oh yes, a sari would be a nice option for you try in India. They're very colourful for sure. Coffee Messiah Thank you. The first time I uploaded a video here, hope that helped. Anil, you always take the simplest of things and write about it so beautifully. As always, just loved this blogpost. 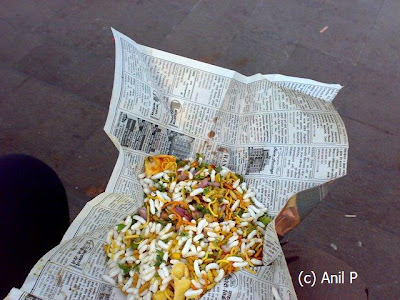 Having the chivda/bhel making on film is such a great idea! Kiran: Thank you for letting me know how you feel about the writing here. It's a very encouraging feeling. An informative (and hunger inducing) post. Fabulous photography as well! What a colorful account you've created, and the inclusion of the video with sound brings the reality so very much to life! Thanks for your visit and comment on my blog today! Chuck Pefley: Thank you. The short video helps. Fabulous post. And yes, now I'm hungry. My home town is famous for two kinds of Chevda- Sholapuri Chevda and Green Chevda. Sholpauri chevda is from deep fried hajikhani- not poha. Green chevda (or lilo chevdo as we call it)is from shredded potatoes, with lots of masala, peanuts and what's more, sugar. Must try this Nasik Chivda sometime. Your descriptions are as beautiful as they are thorough. The subtleties of the spices that you describe are reflected in your colorful photography. Wonderful. Ahh, this brings back memories of some special foods prepared at Yatai, the roadside stands in Hakata, Japan. I certainly wish some would be available packaged for export. Oh Anil, thank you for this multi-sensory post! Austere: Thank you. I've been to Solapur several times, yet to sample the local Chivda there. Butternut Squash: Thank you. The details will hopefully help readers get a clearer idea of the preparation. Rouchswalwe: Thank you. Roadside stands in Japan? That's new to me. Are roadside stalls out there just the way out here? I think eventually some businesses will see potential in packaging many of such street food varieties. The combination of your writing, food images and video captivated me. I'm going to see if I can find a packet in the local Indian market here. I can only image the taste and smell. It certainly does look delicious. If there're Indian stores around where you live, you could try some varieties of Chivda. Yet another fascinating lesson/travelogue! BTW, just what is gram? I note that is an important ingredient. Any relation to what we call graham crackers here in the States? Thank you for the idea, Anil! I've posted something about street stalls in Japan for you at my place! Love the photos... glad I found your blog again after taking a long break from blogs. I always buy those spicy mixes (we have a lot of shops that carry them in the tri state area - ny nj ct) I often buy one called Swad Mix, sometimes I get cilantro chutney also. I'll pay more attention now to the various crisps. So much chivda love.... and i've never paid attention to it.. mum always has a "barni" full.. I had a little trouble following what all the different foods I didn't recognize were, but the pictures look delicious. Your blogpost, pictures and the comments by Ugich Konitari are making me HUNGRY! Really nice artucle ON VERY MUCH neglected topic from nashik..